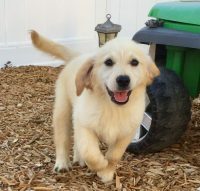 Golden Retrievers are one of the top ten most popular dog breeds in America. Their friendly personalities, high levels of intelligence, and natural agility make them an ideal breed for everything from therapy dogs to family pets. Goldens aren’t high-maintenance dogs, but they are natural pack animals and need to be part of a family. They have high levels of energy and intelligence, so obedience classes are always a good idea. These dogs will also need to be kept busy and occupied so they don’t develop bad habits from boredom. Due to their long coats, Golden Retrievers are constantly shedding, even if they are brushed frequently. If you are considering getting a Golden as a pet, be sure to have a good vacuum and be prepared to use it frequently! Male Golden Retrievers are, on average, between 23 to 24 inches tall, and weigh between 65 to 75 pounds. Female Goldens are a bit smaller, and come in at approximately 21.5 to 22.5 inches, and generally weigh between 55 to 65 pounds. 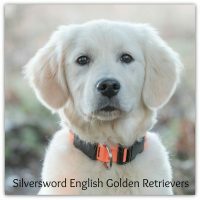 Recently, some breeders have been selling “rare white” Goldens, even though this is not recognized as an official breed coloration by the AKC. There is nothing wrong with buying one of these lighter-colored dogs, as long as you are aware they are not an officially recognized variant. 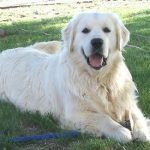 All variety of Goldens come with thick coats that require frequent brushing. They shed a lot, but most frequently in the spring and fall as they shed their summer and winter coats. Golden Retrievers are known for their puppy-like behavior. 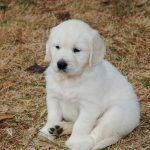 While they reach their full size at about one year, and their full weight at two, Goldens differ from other breeds in that they maintain their enthusiasm, energy, and dorky behavior from puppyhood well into adulthood, and often for their entire lives. This tendency can make them delightful pets, great with kids, and fun, entertaining members of the family. 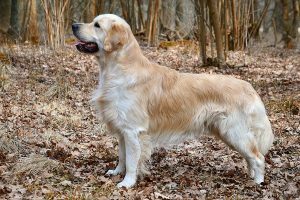 Unfortunately, this behavior can occasionally be annoying, and can lead to behavioral issues if there isn’t proper training and adequate preoccupation for your Golden. Coupled with their high energy levels, their heightened intelligence means that Goldens need to be kept physically and mentally engaged. Long walks, frequent play time, and family activities are necessary to keep them happy and contribute to their good behavior. This heritable disease occurs when the elbow joints don’t form properly and may cause lameness that can require surgery to correct. Another heritable condition, this can cause the hip joint to not fit into it’s socket correctly, resulting in limping or lameness and an increased risk of arthritis. These can form as cloudy spots in the eyes that may or may not impair vision and can develop at any age. Surgery to remove cataracts is generally successful. A brain disorder which can cause seizures and tremors. A vet may be able to prescribe medication to help. 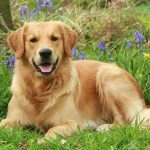 Goldens can be allergic to many things, from certain foods to seasonal pollens. Excessive licking of paws and mouth generally indicates an allergic reaction. This is a bone cancer that is common in large-breed dogs and can develop at any time. If you are buying from a breeder, always be sure the parent dogs are certified by a reputable vet as being free of potentially heritable diseases or health complications. Goldens were originally used to retrieve small game by hunters – this is where the “retriever” part of their name comes from. Thanks in part to their sports background, Goldens are very agile and excel at sporting events and agility courses. Their sweet, puppy-like behavior, friendly faces, and high levels of intelligence make dogs of this breed a great option for therapy dogs, emotional support animals, and disability assistance dogs. Goldens are one of the most popular choices for seeing eye dogs and mobility assistance pets to help with tasks such as turning on and off lights and retrieving objects. Goldens can also be trained as drug sniffers and bomb detection dogs, and can participate in search and rescue operations. These are truly remarkable and versatile animals.